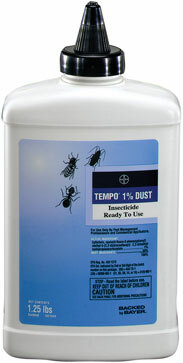 Tempo 1% Dust with 1 percent Cyfluthrin is effective in controlling a range of pests, including bees, wasps, hornets, beetles, crickets and spiders. 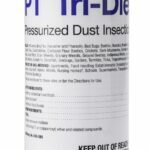 Tempo 1% Dust with 1 percent Cyfluthrin is effective in controlling a range of pests, including bees, wasps, hornets, beetles, crickets and spiders. 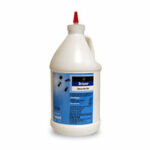 Tempo 1% Dust also provides excellent knockdown and residual control against bed bugs. Even those proven resistant to other pesticides, makes pest harborages uninhabitable, and is an ideal solution for deep penetration into cracks, crevices, and other hard to reach areas. Tempo 1% Dust is an “all around” dust that provides a long residual against a variety of perimeter pests, especially stinging insects like bees and wasps. o Can be used both indoors and outdoors. o Effectively controls stinging insects, particularly bees and wasps. o Provides a long residual and can remain active up to a year if left undisturbed.